...my daughter can go to school and not be in any pain. thank you again for your book and helping people like my daughter and myself when the doctors could not. "Michelle is a healer who understands the strength of combining natural medicine with hard-core science. 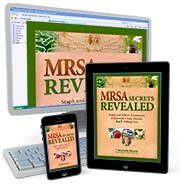 I consider her program to be the best tool I’ve seen for MRSA." "I’ve worked with doctors all my life and know what’s out there. I thank God for people like you! 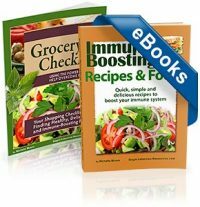 The book was very informative and exactly what I needed to know." "When my son got MRSA, I was devastated... The principles in your book saved my life AND my quality of life! This book, to me, is like a bible to follow for your health... I am doing very well, and am in full remission." 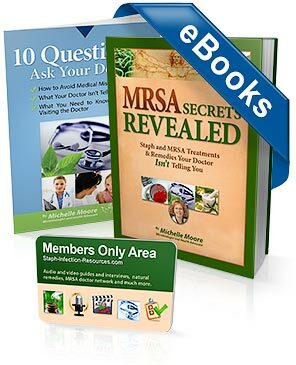 Michelle Moore’s best-selling program, MRSA Secrets Revealed™ is the definitive guide to enhanced Staph and MRSA relief and control, now in its 5th edition. Includes Michelle’s 3-Step Infection-Free Method™. Buy now and also receive a the bonus manual plus online access to expert interviews, Michelle’s support videos, free members area access and more. Electronic download version you read on your mobile device, tablet, PC or Mac. Free Adobe Acrobat Reader or Adobe Digital Editions app required. NOT printed books. 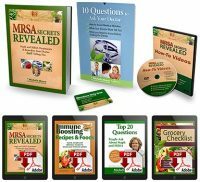 MRSA Secrets Revealed gives you all the tools you need to control your infection, speed your recovery and address the underlying cause of all types of MRSA or antibiotic-resistant Staph infections. It also provides safe and non-toxic methods for cleaning and prevention. Michelle will personally guide you through her 3 Step Method with her eCourses and online customer-only resource center. You’ll get step-by-step instructions, expert interviews and detailed protocols for handling all types of Staph and MRSA using the safest, most effective scientifically-proven remedies, either alone or along with antibiotic drugs. You’ll also get ongoing email support to answer any questions you have. Join over 16,000 others in 38 countries who have benefited from Michelle’s experience, research and remedies. 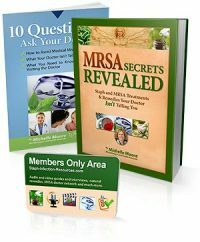 Her program includes the e-book MRSA Secrets Revealed plus the bonus e-guidebook 10 Questions to Ask Your Doctor About MRSA. Michelle’s support emails and links to the customer-only resource center arrive via email. Electronic download version for mobile or computer. I have yet to see ANYONE who actually USED the material in the Program fail to show improvement. So why wait… jump on this opportunity and change your life as I did. P.S. 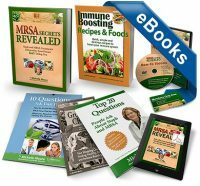 These methods work because they go beyond simply treating your symptoms and get to the root cause of your MRSA infection. P.P.S. DON’T FORGET: you have 120 days risk-free to test out my Program for yourself. If you decide that my plan is not for you, then just write for a refund. No questions asked. We want you to know that you can order our program risk-free!